Klubíčko (Ball of yarn) is a Mirror class dinghy popular in the U.K. and other countries like South Africa and Australia. Rig = Gunter with optional spinnaker. The Mirror is a small, light, easy to sail, easy to transport, pram dinghy. 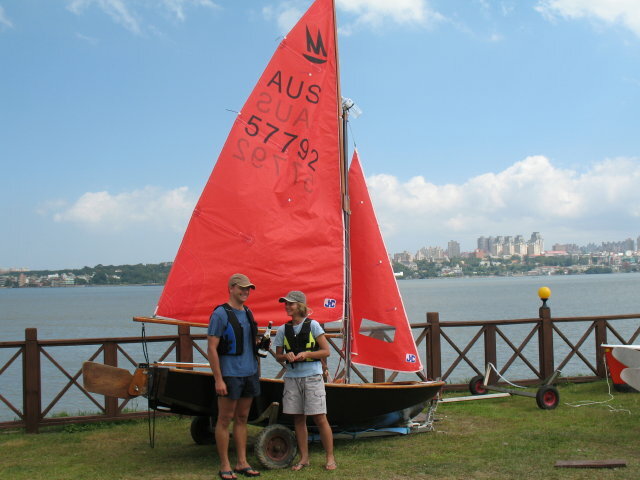 Basically a stable family boat for all ages and abilities, ideal for just “messing about”, it is also raced widely and actively both in the UK and abroad. Its ease of handling makes it a very good single-hander. For racing the crew is two but when pottering three can be carried. The boat can be rowed or fitted with a small outboard motor – it can then accommodate four or five people. Ideal for training young people, it is an RYA-adopted Junior Class. Many of the UK’s top sailors started in a Mirror! A strict one-design, the Mirror became an International Class in 1989.